Good things happen when we work together. Join with us as we make life a little sweeter. We take our Mission, Vision and Principles seriously and that’s why The Melting Pot enthusiastically supports St. Jude Children's Research Hospital® in the fight against childhood cancer and other life-threatening diseases. One of the ways that The Melting Pot supports St. Jude is through the annual St. Jude Thanks and Giving® campaign. From mid-October to end of December each year, guests have an opportunity to donate to the kids of St. Jude when they dine at any of The Melting Pot Restaurants nationwide. For every $10 donated, guests receive a Donate and Dine card valid for $20 off a future purchase of $50 or more at The Melting Pot. One hundred percent of each $10 donation is given directly to St. Jude for their important work. 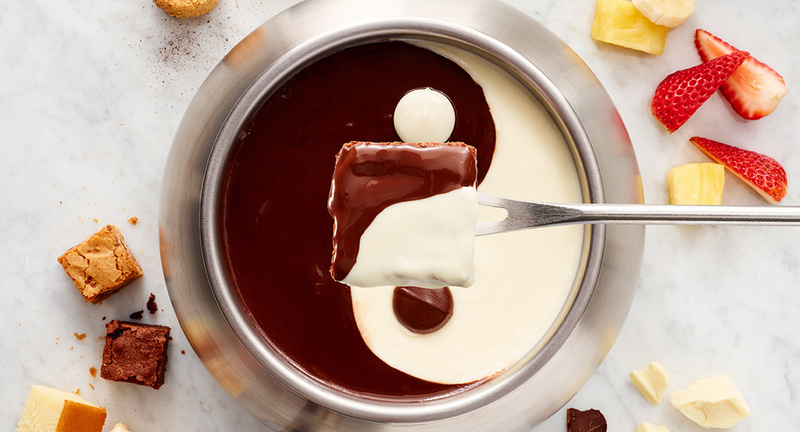 The Melting Pot Restaurants also offers support for St. Jude year-round through the sale of signature chocolate fondue wafers. For each $5 box of chocolate fondue wafers purchased, $1 is given to the hospital. Additionally, 50¢ for each kids specialty drink purchased in a take-home piggy bank cup is donated to St. Jude. "Through these collaborative efforts among all of our restaurants, each of our guests have an opportunity to make a significant impact in helping St. Jude children fight cancer and other deadly diseases," said Bob Johnston, CEO of Front Burner Brands, restaurant management company for The Melting Pot. "Our family of restaurants and team members are very excited to know that their dedication and hard work touches the lives of so many children." Each year, The Melting Pot sends top-fundraising team members from across the nation during the previous year's St. Jude Thanks and Giving campaign to Memphis to tour the hospital and serve chocolate fondue to St. Jude patients and their families at a special fondue party. The Melting Pot has raised $12 million for St. Jude since the partnership began in 2003. The Melting Pot couldn't do it without the generous support of team members and customers who make this meaningful contribution possible for the kids of St. Jude.